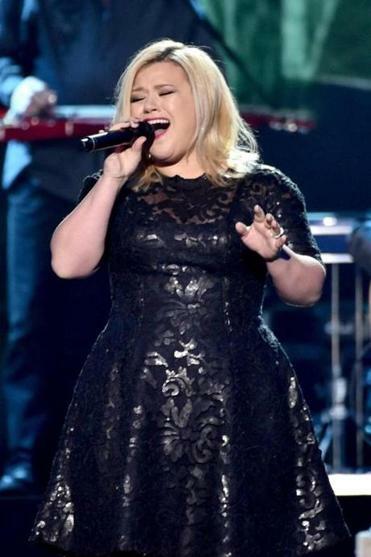 Kelly Clarkson performed during the 2014 American Country Countdown Awards. Kelly Clarkson has a great big voice. It is a voice with the power to scrape the sky with unbridled emotion. Every feeling — from joy to anger to anguish to enthusiasm — is writ large when the pop star wants to go for broke. And on her mostly appealing new album, “Piece by Piece,” Clarkson often wants to go for broke. As such, the inaugural “American Idol” victor and her collaborators surround her instrument — as she typically does — with great big production both for good and for ill.
Perhaps that is because, as the next song, “Invincible,” tells us, she had been in a hopeless place filled with silent tears but now she is ready to rev it up again. Tuneful, glossy, and empowering, the song — co-written, as was the paean to supportive friends “Let the Tears Fall,” by Sia — is right in Clarkson’s wheelhouse. Elsewhere she hits the floor with the Giorgio Moroder-esque stutter beats of “Dance With Me,” hits the road with John Legend for a sweeping take of Tokio Hotel’s “Run Run Run,” and hits close to the heart with the clearly personal, deeply emotional and meditative — and yet still sonically grand — title track. “War Paint,” with its tribal drum sounds and pleas for peace, fellowship, and connection — among women, within relationships, in the world at large — is a standout.